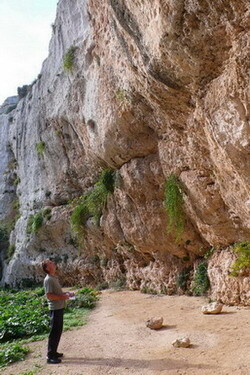 Normally you would not figure that Gozo is a rock climbing destination. 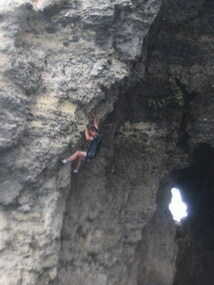 But Gozo is an undiscovered heaven for rock climbers. Located in the middle of the beautiful Mediterranean Sea it offers plenty of rock. Cliffs girdle virtually the entire Northwest coasts and there are also stretches of inland cliffs; together, these offer all grades of climbs, from moderate to very technical. The limestone rock, washed out by millenia of rainfall, has steep walls and overhangs which provide excellent routes and invite climbers to go to ther limits. Thanks to the small size of the island the climbing spots are never far away and you can easily go there by car. 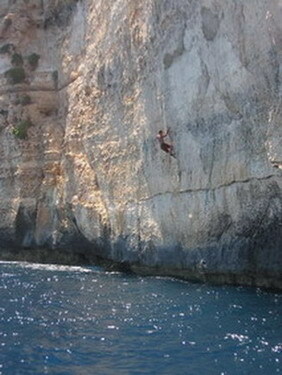 More and more Gozo is gaining in popularity amongst the climging fraternity. It offers enough variety and challanges to fascinate even the most experienced climber. Rock climbing on the Maltese Islands is possible throughout the whole year; however the main season is during the mild winter months - October to May. 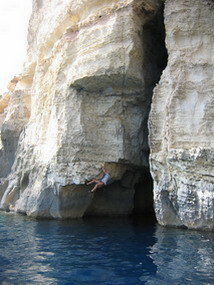 Gozo is undoubtedly an undiscovered climbing paradise and the ideal place for a rock climbing holiday. If you have any questions or neet further information about climbing in Gozo, equipment hire or accomodation, please do not hesitate to contact us. We will be happy to deal with your request as soon as possible.